#420 Topsail: As close to the water as you can get! Sweeping views in this cozy 2-br cottage! This cottage offers sweeping views of the ocean complimented by a large open living space and a perfect deck to enjoy the outdoor space. 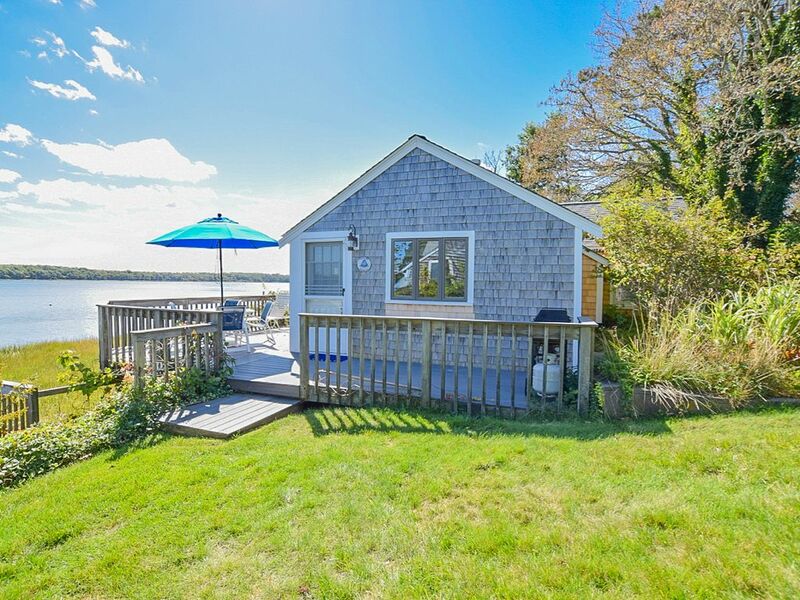 It is truly as close to the waterfront as you can get and the views alone make this cottage a perfect place to experience Cape Cod. Our cottage is perfectly located on the Nauset cove and estuary. The large, gated deck is where you'll enjoy cocktails and grilling, watching boats in the bay, birds and beautiful sunrises and sunsets. Inside you'll find a galley kitchen, two bedrooms, a queen bed in one and 2-twins in the other, a gas fireplace in the living room and well equipped galley kitchen as well as an updated bathroom. The living space also offers a full-size futon for overnight guests. Stay cool and connected with A/C units in both bedrooms and secured wifi and satellite to enjoy on your flat screen TV. Anchorage on the Cove by Del Mar Vacations offers a full vacation experience in one place. Put your boat in at Town Cove and pick up your guests right at our boat dock for a day trip to anywhere! Enjoy use of our kayaks, canoes or skiff or bring your paddleboard or fishing poles to explore the area. We are centrally located near shopping, bay and ocean beaches, bike trails, art galleries, theatres, great restaurants, and the Cape Cod Institute and Cape Cod Symposia. Thank you Chester & Happy Anniversary! You have captured the essence of our home nicely. We would welcome you back anytime, use your $100 discount for returning guests on your next reservation! The property has wonderful views of the bay from the most rooms and feels secluded and private. It is light in the day time but cosy at night. Warm and welcoming with everything you would need. Thank you Julia, you have really captured the feel of our #420 Top Sail home! Come back soon! This being our 17th (!) stay at Anchorage on the Cove is a testament to the pleasure and serenity this place gives us. The waterfront view is stunning every day with each changing color of this season, Topsail is peaceful, private and well maintained. We love and cherish the owners, our long-time friends Kathy and Dennis, and the new management provided attentive, swift and friendly service. See you next time! The view from this cottage was the prime attraction. The cottage was clean, cozy, and good size for a couple. Deck was nice. Location, near Orleans, was also a plus. A/Cs in the two bedrooms helped to deal with the humidity. Would definitely stay here again when on the Cape. We had a beautiful stay at Anchorage on the Cove. We have been coming here for over 20 years and we love the peaceful location and breathtaking views. I can’t wait to return! What a view! Sunrise over the water every morning. I'm afraid to say to much about this place because I want it to be available next year. (maybe sooner.) If you'er looking to relax look no further. the layout and decor is charming and very cape cod. It was a bit cozy for 4 adults (Mom, Dad and two recent collage grads) but not in a bad way. We managed many of our own meals and the kitchen is quite usable for one cook but only one cook as the galley kitchen is tight. I used the out door shower every day. Did I mention the view! Oh man, that view! Coffee on the deck, overlooking the town cove is fantastic. The sun hits the deck from sunrise to right around 4pm. You could have a great time and never get back in your car or you could explore the area. It's a 2 mile paddle to Nauset beach which takes about an hour depending on the tide, weather, your crew and ability. W e brought our own canoes but it looked like the kayaks they had were in good shape and ready to go. We made that trip a couple times. No crowds, no paying for parking. (no bathrooms so go before you go) If you want the beach without the paddle you are a short drive to the national seashore (Nauset or Coast Guard Beach) or town beaches like First encounter beach, Skaket beach or that little hidden gem, Dyer Prince Rd beach, I met Denis the owner. Great guy (I could talk to him all day) He asked how our stay was going and if there was anything we needed. He had some great advice about the area. My wife and I are thinking of booking this place again for our anniversary in October if it's still available.